West Bengal Joint Entrance Examination (WBJEE) 2018 was held on April 22, 2018. The WBJEE Board has declared the WBJEE 2018 Result, on May 23, 2018. As per the official notification, the result was to be declared at 04:00 pm but was released at 02:45 pm, at wbjeeb.nic.in. The candidates can now check their thier score and rank in the examination via the result of WBJEE 2018. The qualifying candidates of WBJEE 2018 will get admission in universities, government colleges, self-financed engineering and technological institutes. The result will be granted on the basis of WBJEE 2018 PMR and GMR. 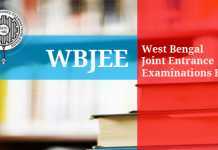 Check more details about WBJEE 2018 from this page. Latest: Mop Up round seat allotment of WBJEE counselling is now available. Candidates can check the same from the ‘Counselling’ page. Click on the link provided on this page. Enter application number and password in the required space. 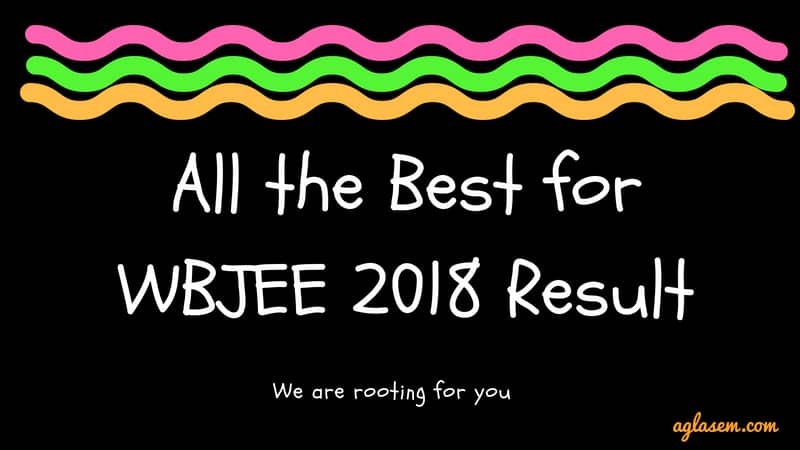 Check and download the result of WBJEE 2018. The result will not be sent via any offline medium. Hence, the candidates should download and save it after checking it. How is WBJEE 2018 Result Prepared? – The result will be prepared on the basis on the basis of the final answer key. The Board prepared the final answer key after analyzing all the objects send against the preliminary key. WBJEE 2018 Rank Card – The WBJEE 2018 Result is announced as a rank card. It contains rank and score secured by the candidates in Paper I for Mathematics and Paper II for Physics and Chemistry. The rank card will be issued to all the candidate who appeared for the examination. However, not all the candidate with a rank will be eligible for counselling. WBJEE 2018 Duplicate Result – It is highly advised that the candidates download the result of WBJEE 2018 after checking it. However, it should be noted that the candidates cannot request for duplicate WBJEE 2018 Result after the end of counselling. Yet, if a candidate needs a duplicate WBJEE 2018 result then the candidates need to submit a request for the same with WBJEE Board. The request is to be sent by July 31, 2018. The candidates will also have to pay a processing fee of Rs. 500 through a bank draft. The bank draft is to be prepared in the name of “West Bengal Joint Entrance Examination Board”, payable at Kolkata. WBJEE Board releases two merit list. One is called as GMR and another as PMR. WBJEE 2018 GMR – General Merit List is prepared as per the performance of the candidate in Paper I and Paper II. It is prepared for those candidates who seek admission in Engineering / Technology / Architecture courses and to Pharmacy Course in Jadavpur University. 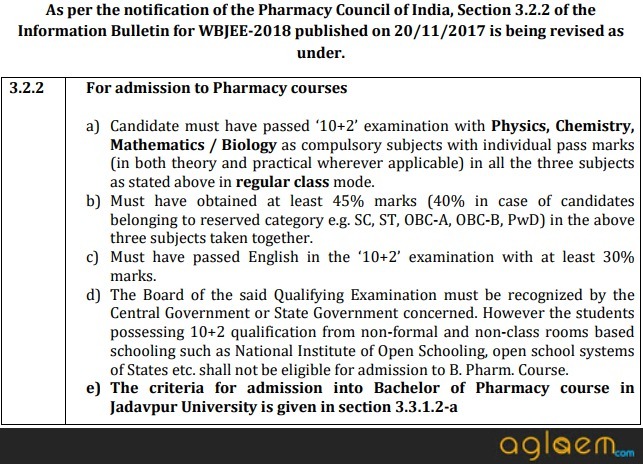 WBJEE 2018 PMR – Pharmacy Merit Rank is prepared on the basis of the performance in Paper II. PMR is used for granting admission in all the Pharmacy courses, except Jadavpur University. WBJEE 2018 will be held in 23 districts of West Bengal and in Assam and Tripura. Candidates may check all the important dates for West Bengal JEE 2018 from the table below. There are 4 categories of institutes which participate in WBJEE. These are (i) State funded/State aided Universities / University Department, (ii) Government Engineering & Technology Colleges, (iii) Private & Self Financing Universities, and (iv) Private & Self Financing Engineering & Technology Colleges. Before the exam, the admit card of WBJEE 2018 has been released. It is issued online and the candidates can able to download it from the official website. On the exam day, the admit card is to be carried as a hard copy and in good condition. Distorted or soiled admit card of WBJEE 2018 will not be accepted. Candidates can request for the duplicate admit card. If a candidate will request for the duplicate admit card after the examination then they will be required to pay Rs. 500, through DD to the WBJEE Board. West Bengal Joint Entrance Examination 2018 will have multiple choice questions. Each question will have 4 options. Exact exam pattern of WBJEE 2018 will be known when WBJEE 2018 information brochure is released. Until then, candidates can take a look at past year exam pattern to go ahead with their exam preparation. As can be seen, there are three types or categories of questions. 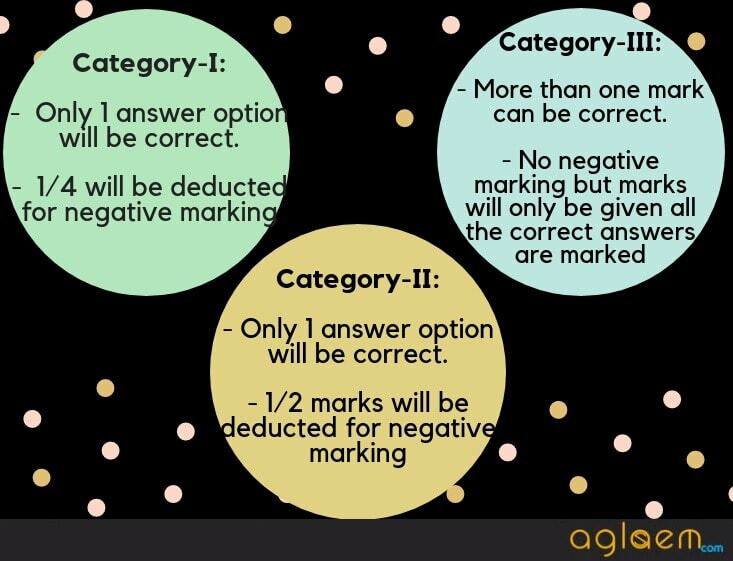 In each category, the marking scheme is different and is as displayed in the image below. Broadly speaking, the West Bengal Joint Entrance Examination syllabus is based upon PCM topics taught in classes 11th and 12th. Even so, WBJEEB specifies complete WBJEE syllabus so as to make things easier for aspirants. Candidates can check WBJEE 2018 syllabus from here or information brochure (which is yet to be released). Since the syllabus is crucial and vast, it has been talked about separately. Check complete WBJEE 2018 Syllabus here. Question paper of WBJEE 2018 will be separate for Mathematics, Physics and Chemistry. 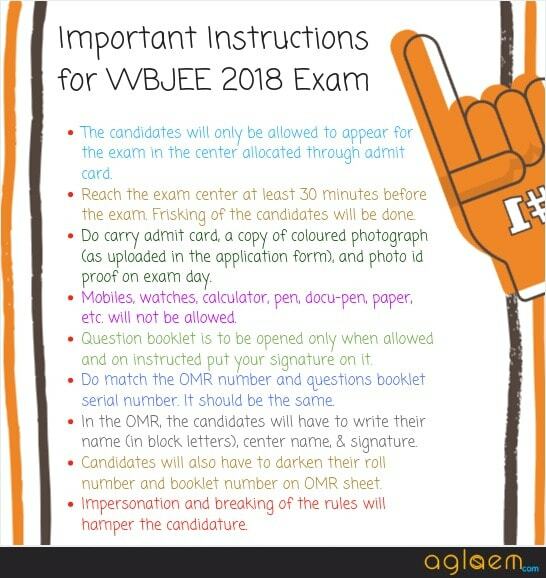 Since WBJEE is a offline pen-and-paper based exam, students can take home the WBJEE 2018 question paper after exam. This is helpful for them as they can use question paper and answer key to check exam performance even before the board declares result of WBJEE 2018. Question paper of WBJEE 2018 is also useful for students who will appear for WBJEE 2019 as a previous year question paper which they can use to prepare for exam. For students who are appearing in WBJEE 2018, it is advisable to go through last year’s exam question paper and practice. West Bengal Joint Entrance Examination Board (WBJEEB) will release model answers of WBJEE usually around a week after the exam. Candidates can check the WBJEE answer key 2018 for mathematics, physics, chemistry and know how many questions they have marked in answer sheet that are correct. The purpose of releasing the answer keys is to let candidates know transparently about the marking process. Immediately after the exam, several coaching centers will also publish the WBJEE 2018 answer key. There could be some differences between them, and the official answer key of WBJEE 2018. However it will be useful to analyze exam performance. The board will compile results by checking marks against the final official answer keys. After the declaration of the final results, the candidates will be provided with the notification with details of e-counselling/seat allotment and admission. All the details related to counselling will be published on the official website www.wbjeeb.nic.in , as per the schedule dates. Only the eligible candidates will be considered for this e-counselling. (WBJEE) is held for admission of candidates in colleges and universities of the state. The exam is conducted by WBJEE Board and the admission is granted in the UG Pharmacy, Engineering, and Architecture courses. For the admission in 2017-18 session, WBJEE 2017 was held on 23 April 2017. The candidates, who will secure an appropriate rank in WBJEE, will be called for seat allocation in Government Colleges and Self Financed Institutes. 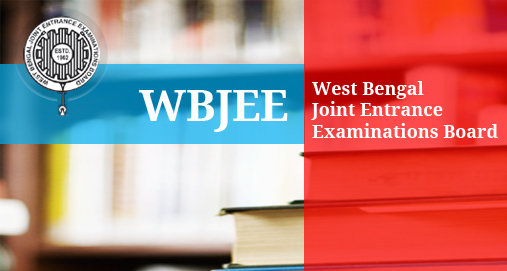 Read more to know the eligibility criteria, selection procedure, counselling details and more information on WBJEE 2018. As of now, no significant changes have been reported in the West Bengal Joint Entrance Examination. WBJEE 2018 is on the similar lines as that of last year. However, if there are any changes then they will be notified by WBJEEB in January 2018. As soon as any changes are officially published in WBJEE exam, they will be updated here. WBJEE 2018 is a common entrance examination in offline (pen and paper mode). By pen and paper mode it means that question paper will be provided in paper format (hard copy). Candidates who appear in exam will mark answers in an OMR answer sheet which will be provided to them in exam hall. A sample OMR sheet may be obtained from WBJEEB website for practice purpose. In an OMR sheet there will be bubbles / circles in front of a question number, which has to be filled in to indicate answer. Bubble must be completely filled so that OMR reader machine can know that candidate has marked that as an answer. WBJEE 2018 exam subjects include Physics, Chemistry, Mathematics. There is one paper on Mathematics and another combined paper on Physics and Chemistry. The Paper I or Paper 1 refers to Mathematics question paper and Paper II or Paper 2 refers to Physics and Chemistry question paper. Paper I and Paper II both need to be attempted by candidates who wish to get admission in Engineering / Technology / Architecture. Also, it is essential for admission to Pharmacy in Jadavpur University. Appearing in only Paper II is sufficient for Pharmacy admission in any college except Jadavpur University. Even those who appear in both papers are eligible for Pharmacy. Eligibility criteria of WBJEE 2018 include the restriction on nationality, age, educational qualification, domicile. Nationality – Only Indian nationals are eligible to apply. Age limit – The lower age limit to appear in WBJEE 2018 is 17 years as on December 31, 2018. There is no upper age limit for WBJEE 2018. In case the candidate is applying for the Marine Engineering course, the lower age limit is 17 years, and upper age limit is 25 years as on December 31, 2017. 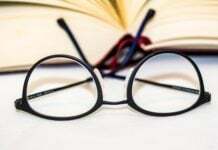 Educational Qualification – Eligibility criteria with regards to education is again specified separately for candidates who come under GMR and PMR. They must have passed class 10+2 with Physics, Mathematics both, along with any one of Chemistry / Biotechnology / Biology / Computer Science / Computer Application as compulsory subjects. Candidates must have passed each of the three subjects. The Aggregate marks required in the 3 subjects should be 45%. However, it is 40% for reserved category candidates. Candidates must have passed English in class 12th with at least 30% marks. They must have passed class 10+2 with Physics, Chemistry both, along with any one of Mathematics / Biology as compulsory subjects. Passing marks must have been achieved in all the three subjects separately. Aggregate marks in the 3 subjects should be 45% or more. (40% for reserved category candidates). It is mandatory that they must have passed English ins their class 12 with minimum 30% marks. To get admission in any Government Engineering / Technology / Pharmacy Colleges or in reserved seats, the Domicile of West Bengal will be required. Even to get TFW, the Domicile has to be shown. Candidate should be a resident of West Bengal for a minimum of 10 years, as on December 31, 2017. Those candidates are also an eligible domicile, whose parents are residents of West Bengal and have a permanent address of the state. After registration, the candidates will now be able to enter details in the application form. Candidates should note that the details once submitted cannot be changed. Hence, the candidates should submit it carefully. After the registration is done, the candidates will be able to access the application form of WBJEE and fill all the details in it. The scanned images of the photographs and signatures are also needed to be uploaded during the filling up of the application form. 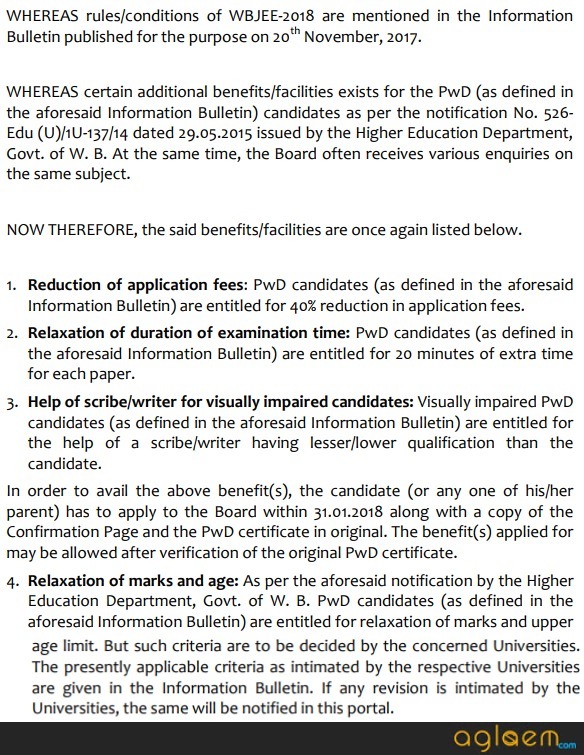 Application Fee: The application fee for WBJEE 2018 is Rs. 500. The candidates can submit it using Net Banking, Debit Card, Credit Card, Paytm or via E challan of Allahabad Bank. Note that 10% seats in the Self-Financed Engineering and Technology colleges of the state will be filled via JEE Main 2018. However, the JEE Main qualifying candidates will also have to fulfil the eligibility criteria of WBJEE 2018. To download or check the information brochure of WBJEE 2018 candidates can – Click Here | Notice regarding Fee Structure. JENPAUH 2019 Answer Key – Estimate Your Scores From Here!